This was my ninth time to Guatemala, a country I dearly love. 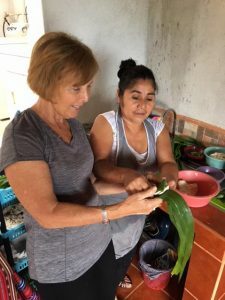 I had visited Guatemala for yoga retreats, for Spanish classes, for archeological sightings, and for volunteerism. This time I wanted to do all of these, plus one more: I wanted to explore the country’s rich Mayan culture and indigenous pueblos. Antigua, less than an hour’s drive away from the capital’s airport, is a calm and beautiful provincial city. The Central Park’s marimba bands jiggle away any worries from back home. Banana bread from Dona Luisa rivals the chocolate from Museo de Chocolate, just a few doors away. Fresh fruits and vegetables explode in the markets; whoever heard of four avocados for a dollar? No need to feel a bit homesick with the ex-pat gatherings and non-stop sports channels blaring at Mono Loco. Fiestas and parades pop up almost year round, with floats and marchers of all ages plopping over flowered alfombras. Cooking schools enhance one’s language skills as well as cooking abilities, with Frijol Feliz offering gourmet preparation and Guatemala Food extending a welcome into a typical home in the suburb of Jocotenango. (More information can be found at info@frijolfeliz.com and www.guatemalafoods.com) And the Spanish schools – they’re hard to beat in any other locale. Mainly, they offer one-on-one instruction so your mind can’t wander during verb conjugation. Some schools cater to youth and college age students, offering credits to their schools back home. “Atrape la pelota” (“Catch the ball”) can be heard ringing out from other schools that specialize in immersing children into language and fun. Many offer homestays where the families welcome their guests into their homes and spoil them with delicious homemade meals. Certainly in Guatemala, pollo (chicken) can be prepared a hundred different ways. 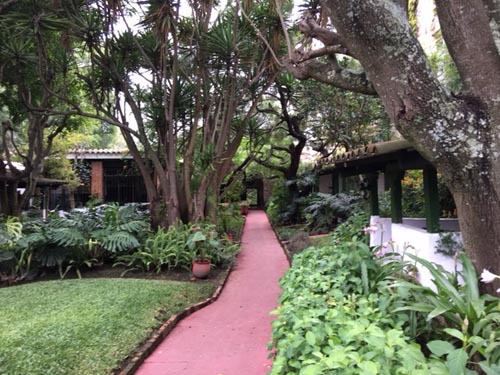 This year I up-scaled my stay and language school experience in Antigua. 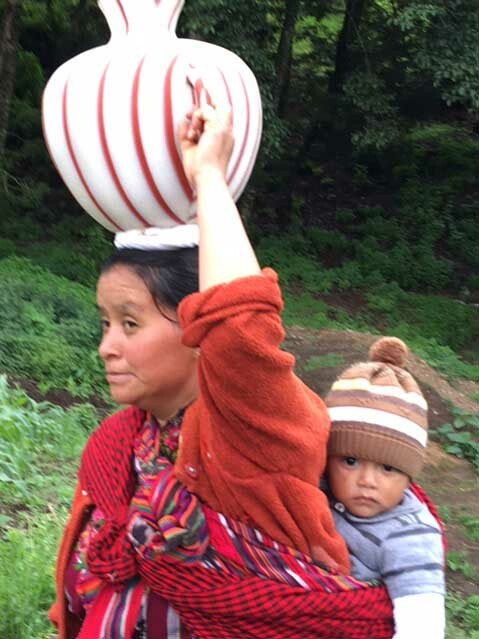 Amigos de Santa Cruz has greatly improved the lives of the indigenous people there over the past decade. 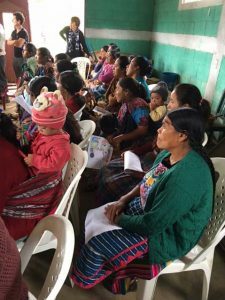 Education is alleviating poverty and empowering people, and community members are taking responsibility for improving their communities. The women are noted for their beautiful crafts, displayed at the pueblo coop that sits high on the hill and jets outward to give an inspiring view of the lake. Upstairs from the store lies the restaurant where salads are pieces of artwork and the memories of the carrot cake entices me to return. At the opposite end of Lago de Atitlan sits the village of Santiago, the lake’s biggest and least-visited town. 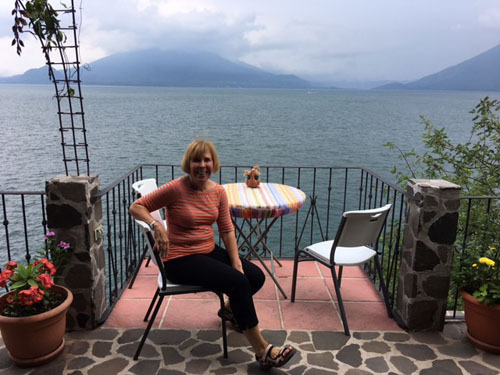 It takes a bit of effort to get there from Santa Cruz because it involves taking a lancha to Panajachel’s private dock, walking about six blocks to the public dock, and catching another lancha there for Santiago. But, it’s worth it. Maximon, the Mayan/Christian deity, plays a dynamic role in Santiago. His deity moves from house to house each year. Visitors can locate his whereabouts, especially if they come decked with cigarettes and booze to leave as an offering. 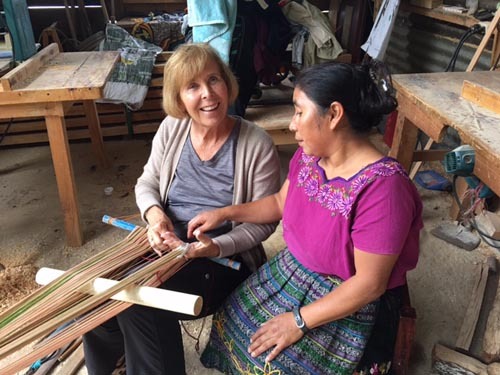 When I was in Santa Cruz, I asked my teacher, Luis, to teach me a few words in Kaqchikel, knowing that I would be visiting the Mayan pueblos of Choantonio and Xesajcap. Appropriately so, he taught me “utz” for “food;” “xsegar” for “good morning;” and “matiox” for “thank you.” I shared these simple phrases with a few women who nodded. But one lady particularly holds a dear spot in my heart. It was in our last pueblo. 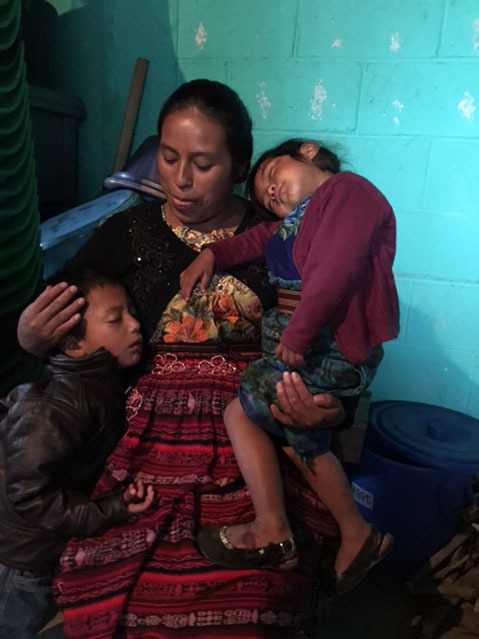 She held her two children tightly in her arms and provided our group shelter in her small home from the pounding rain. I had an extra sandwich that I offered to her. My motions persuaded her that I truly wanted her to have it and so she accepted the gift. We shared smiles, sang to her children, and cradled them in our arms. When we left, I heard her say something that Luis had not taught me. I had to look it up as soon as I reached Antigua. Humbly, she muttered, “Rat ri qa Dios.” Translated, it means, “We’ll go on thanking you eternally.” This was her expression of gratitude to ALDEA for providing a means for her and her family and community to have clean water, nutrition, education, health, income opportunities, and a say in their future.